New York City’s Right to Counsel bill, proposed by Councilmember Mark Levine (pictured), passed on Thursday. As the Trump era drags on, the hope that cities would be bastions of resistance has melted into air. In some cases, cities don’t have the authority to serve as an effective bulwark against Republican control of statehouses and Washington, and against federal agencies like ICE. In others, they don’t have the capacity to preserve or increase protections for the poor and vulnerable. 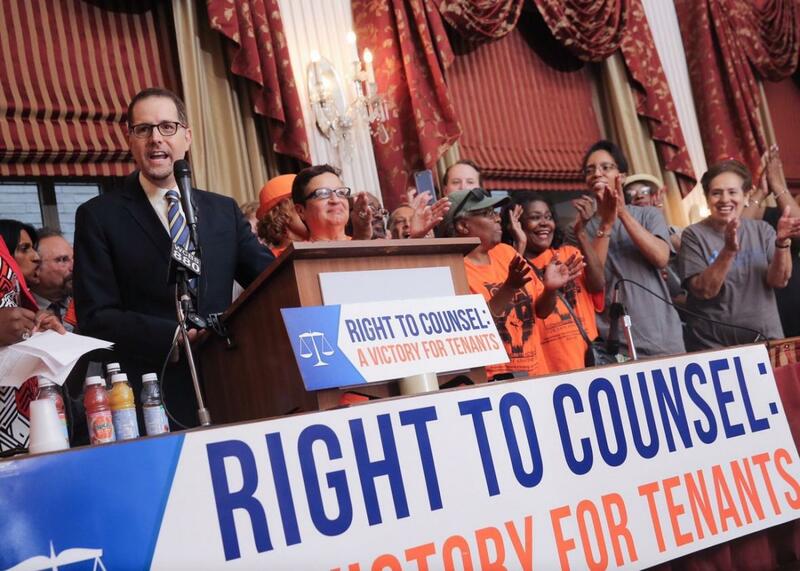 But there is still room for big, simple victories, like the idea Mark Levine, a city councilman from upper Manhattan, has been working on since 2014: Hire lawyers for tenants in housing court. On Thursday, the New York City Council passed a bill that will guarantee, within five years, legal representation for all low-income tenants facing eviction. Mayor Bill de Blasio has indicated he will sign it. An independent study commissioned by the New York City Bar Association estimated the law could keep more than 5,000 families from homelessness every year. Of all the ways that the American financial and legal system leaves renters at a disadvantage, you’d be hard-pressed to find a more unequal terrain than housing court. Nationwide, 90 percent of landlords have attorneys, but 90 percent of tenants do not. Tenants don’t show up to defend themselves or don’t know how. In a randomized experiment performed by the Legal Aid Society, eviction warrants declined 77 percent when the tenant had counsel. Here are the numbers in New York: There are more than 150,000 housing court cases a year. More than 120,000 tenants would qualify for representation under New York’s new law, which offers counsel for households under 200 percent of the federal poverty line (about $50,000 for a family of four). Currently, fewer than 3 in 10 low-income households go to court with a lawyer. There are more than 20,000 evictions each year, and nearly half of all families in homeless shelters are thought to wind up there after eviction. No complex legal reasoning is required here. Policymakers think lawyers can throw a wrench in the eviction machine simply because tenants often have a good case for not paying rent. In Baltimore, research by the Public Justice Center showed that 80 percent of renters facing eviction lived in units with serious defects “like vermin infestation, toxic mold, or broken appliances.” Just 8 percent of tenants had their claims heard by a judge; most either didn’t show up, or didn’t defend themselves. In a rapacious housing market like New York’s, the profit motive behind evictions can be enormous—especially when the tenant occupies a rent-stabilized apartment that can be deregulated through vacancy. That means evictions eat away the rent-stabilized stock, which is by far the city’s cheapest way to preserve affordable housing. Meanwhile, rising rents make it harder and harder for the homeless to get back into apartments. The average length of shelter stay for families with children is over a year. The city’s shelter population is more than 60,000—the size of Palo Alto, California. It will cost a lot to provide lawyers for 120,000 housing court cases a year: More than $200 million, by some estimates. (Then again, the progressive prince of Albany wants to spend more than that on a light show.) Under Mayor Bill de Blasio, the city has already allocated $64 million a year to tenant legal services, up from $6 million in 2013—a move correlated with an 18 percent drop in evictions. The independent analysis, prepared by the consulting firm Stout Risius Ross, projects the policy will save New York money on balance: more than $100 million a year. Each case might cost an average of $2,500, Levine says, but each shelter stay costs the city nearly $45,000 a year. “You don’t have to avoid too many homeless cases before you recoup what you’re spending up front,” he explains. And none of those balance sheets account for the social benefits that accrue from residential stability when a family can maintain access to the same schools, social network, and jobs. Studies suggest that eviction leads to job loss more than job loss leads to eviction. This is not just a high-cost city problem. In Milwaukee, where Matthew Desmond set his Pulitzer Prize–winning book Evicted, there were 16,000 evictions a year in a city of just over 100,000 renter households. The numbers were similar in Kansas City, Cleveland, Chicago, and elsewhere, he wrote. Philadelphia, where counted 20,000 annual evictions between 2014 and 2015, allocated a $500,000 grant to defend tenants earlier this month. Baltimore spent twice as much helping landlords evict tenants ($2.7 million on sheriff’s deputies to oversee 6,500 evictions) than it did helping tenants stay in their homes ($1.3 million). On Monday, Baltimore City Councilman Robert Stokes proposed an anti-eviction fund. Not much power. But if you know how to use it, maybe you can get something done.